As impressive as the powerful road-going 911 ever is, few would imagine it stacks up so well against a current Cup car. So much more than a dragster, the 700-horsepower GT2 RS hangs on closely to the tail of the 991 Cup, and in some sections, clearly has the upper hand. Now, before we assess the performances of the cars, we should know about the drivers, the track conditions, the weights, and so on. With plenty of videos demonstrating his exploits in his Manthey-modified Porsches, sebastian vittel has established himself as minor YouTube celebrity with quite a following among HPDE addicts. He can get just about everything out of this car, which is important if he wants to give a comparable performance alongside the professional in the GT3 Cup. French Porsche factory driver, Patrick Pilet, is the winner of the 2018 24 Hours of Nuburgring and the 2004 Carrera Cup France Champion. Clearly, he's quite handy, and can fully extract all the performance from whatever he drives. In the footage above, the capable vittel is accompanied by a brave passenger, which ought to bring the overall weight of the GT2 RS to roughly 3,600 pounds. That puts it somewhere around 900 over the svelte GT3 Cup, which brings no passenger, no interior, and no turbochargers along for the ride. Factor in the shorter gearing, the slick tires, and the better weight distribution, and the GT3 Cup clearly has a lot going for it. In the road car's defense, its lap was set on a resurfaced track, which is somewhat quicker than when Pilet put in his flyer a couple years ago. 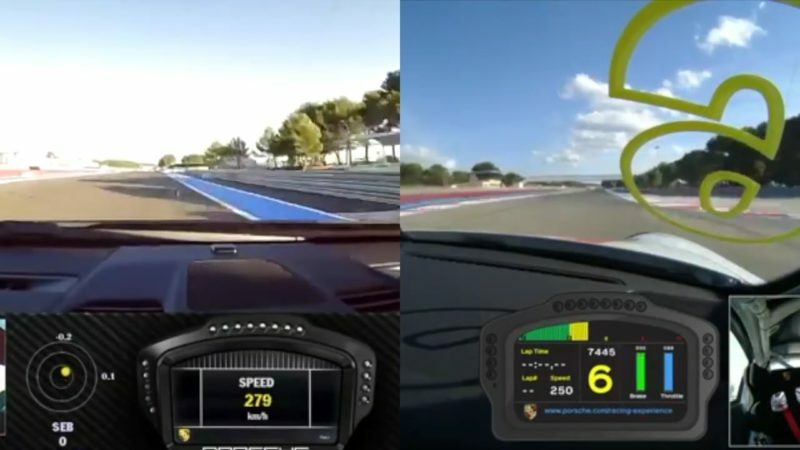 Predictably, the GT2 RS has an advantage in a straight line, which there are plenty of at Paul Ricard. However, the Cup is quicker through medium-speed and high-speed bends—most notably at 1:16, when the GT2 RS turns in nearly a second earlier, but is still caught at the exit. From there on, the technical complex filled with tightening corners favor the lighter Cup so much more than vittel isn't able to make up the difference. Even though the GT2 RS (left) is traveling nearly 14 mph faster at the end of the straight, the GT3 Cup can nearly close the gap from entry to apex. Nonetheless, the GT2 RS puts in a remarkably good time of 2.13.10; just six tenths shy of the GT3 Cup, which snags a 2.12.53. Considering the differences in skill and weight, this clip demonstrates just how the GT2 RS really is, to used a tired expression, a racing car for the road. This time, however, it's not just a marketing line.